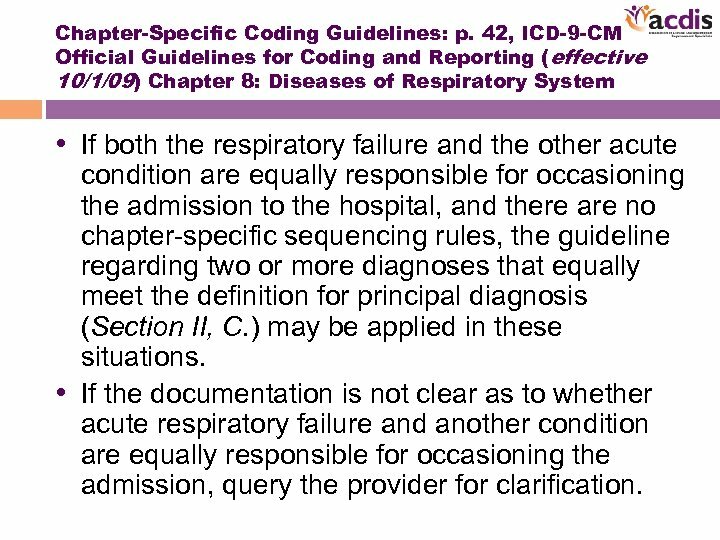 Chapter-Specific Coding Guidelines: p. 42, ICD-9 -CM Official Guidelines for Coding and Reporting (effective 10/1/09) Chapter 8: Diseases of Respiratory System • If both the respiratory failure and the other acute condition are equally responsible for occasioning the admission to the hospital, and there are no chapter-specific sequencing rules, the guideline regarding two or more diagnoses that equally meet the definition for principal diagnosis (Section II, C. ) may be applied in these situations. 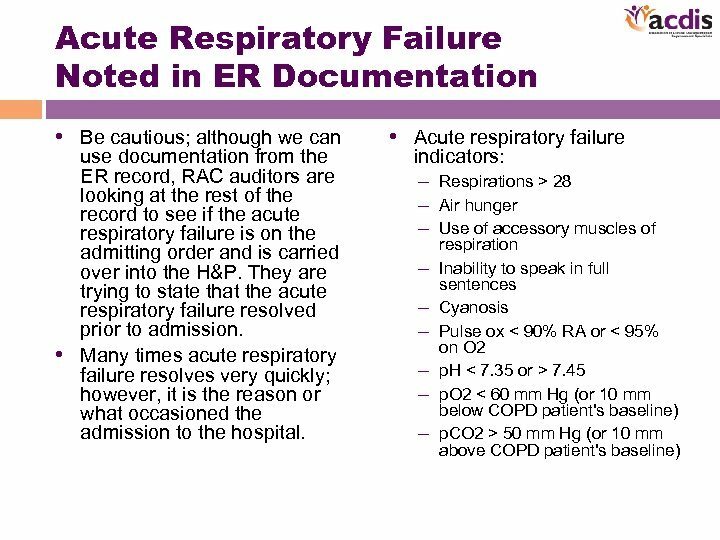 • If the documentation is not clear as to whether acute respiratory failure and another condition are equally responsible for occasioning the admission, query the provider for clarification. 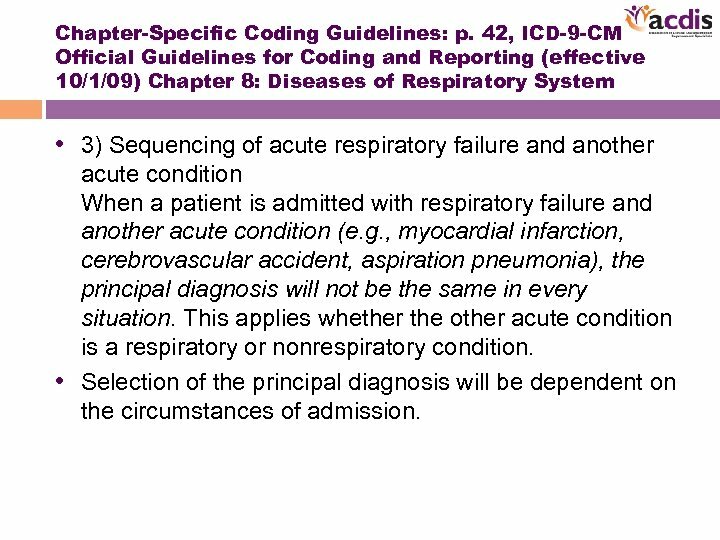 Chapter-Specific Coding Guidelines: p. 42, ICD-9 -CM Official Guidelines for Coding and Reporting (effective 10/1/09) Chapter 8: Diseases of Respiratory System • 3) Sequencing of acute respiratory failure and another acute condition When a patient is admitted with respiratory failure and another acute condition (e. g. , myocardial infarction, cerebrovascular accident, aspiration pneumonia), the principal diagnosis will not be the same in every situation. 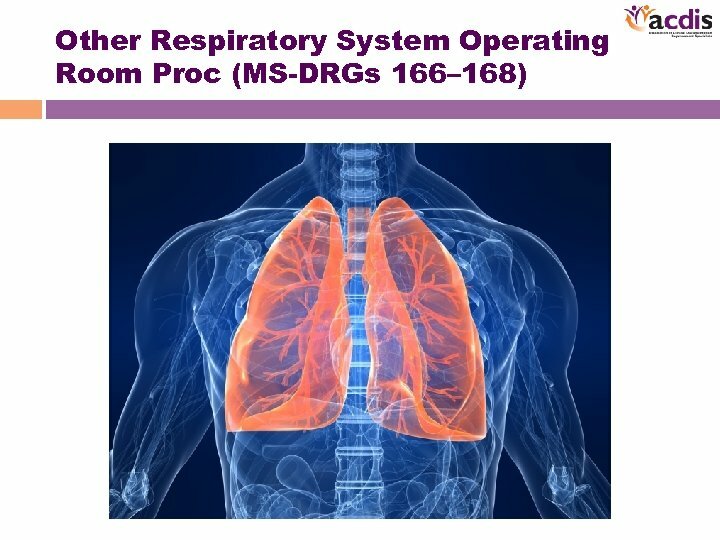 This applies whether the other acute condition is a respiratory or nonrespiratory condition. 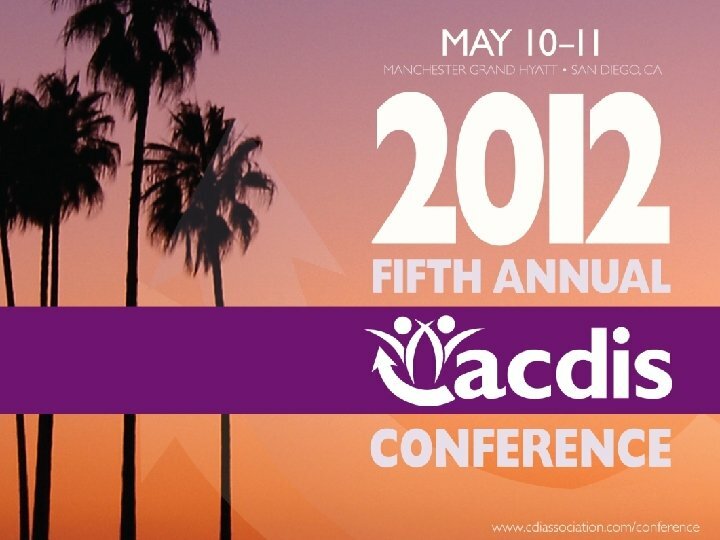 • Selection of the principal diagnosis will be dependent on the circumstances of admission. 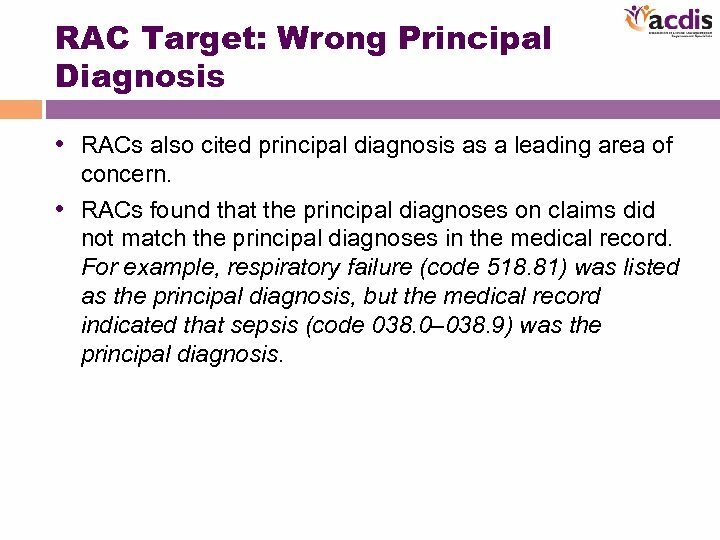 RAC Target: Wrong Principal Diagnosis • RACs also cited principal diagnosis as a leading area of concern. 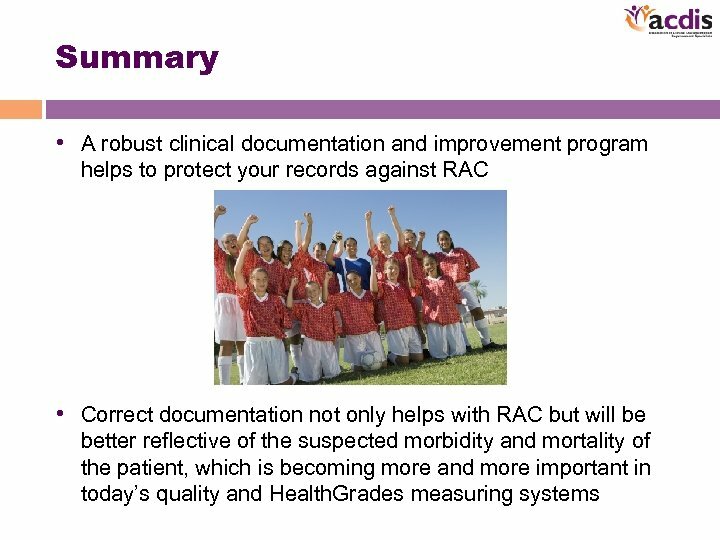 • RACs found that the principal diagnoses on claims did not match the principal diagnoses in the medical record. 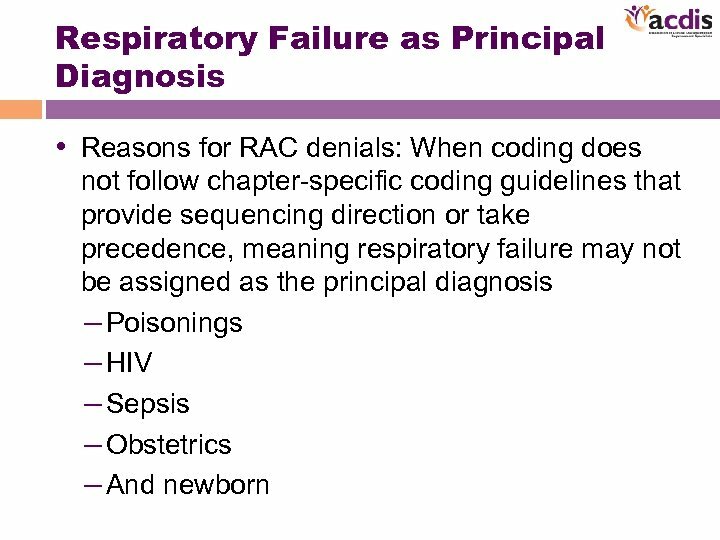 For example, respiratory failure (code 518. 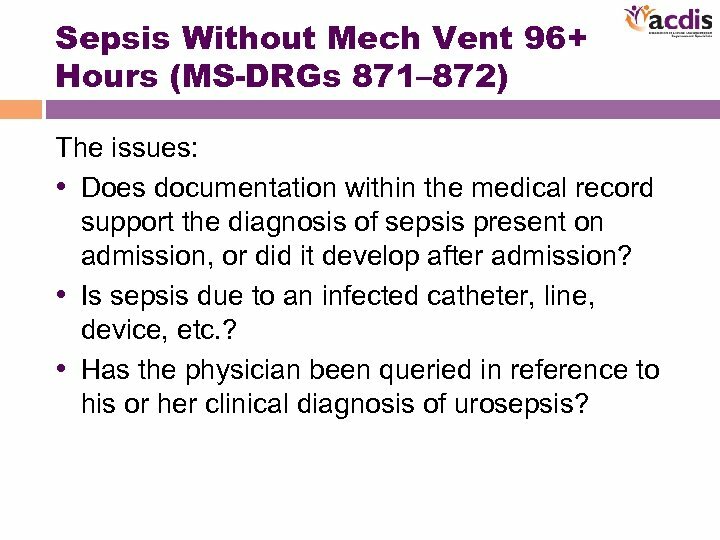 81) was listed as the principal diagnosis, but the medical record indicated that sepsis (code 038. 0– 038. 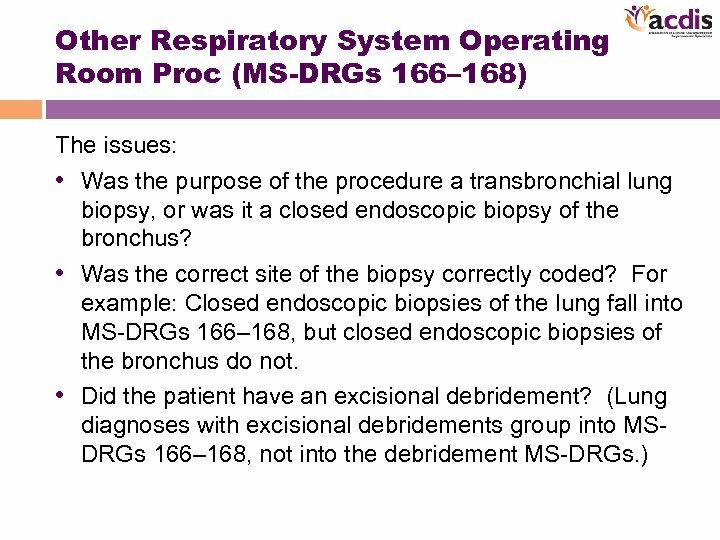 9) was the principal diagnosis. 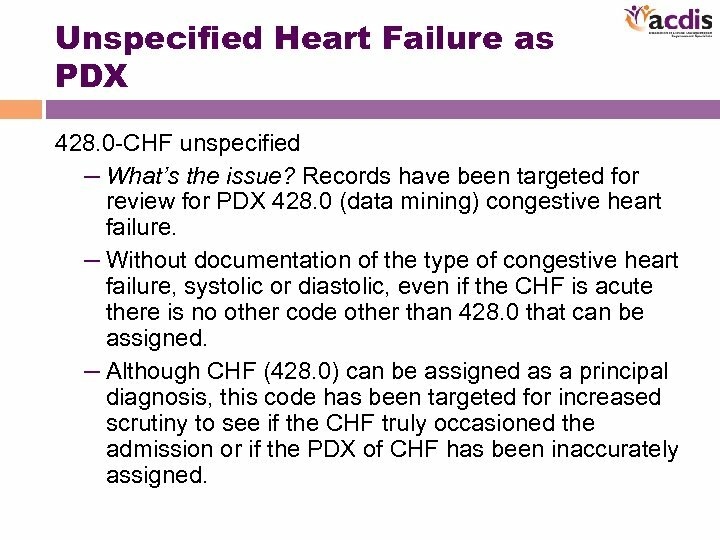 Unspecified Heart Failure as PDX 428. 0 -CHF unspecified – What’s the issue? 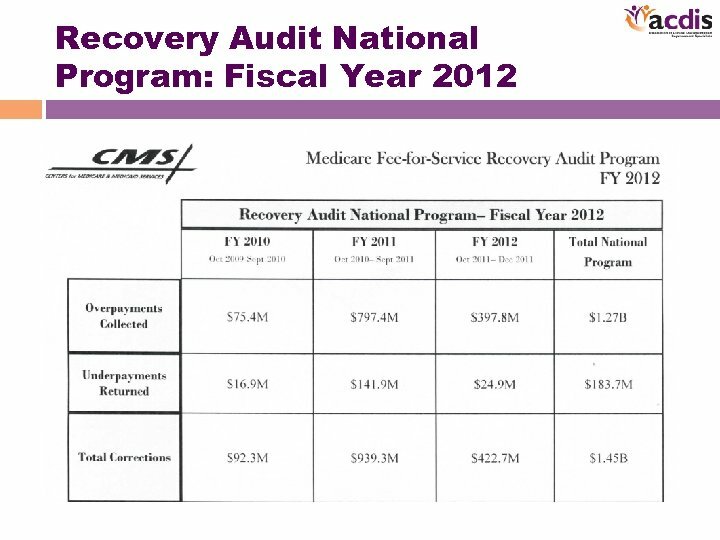 Records have been targeted for review for PDX 428. 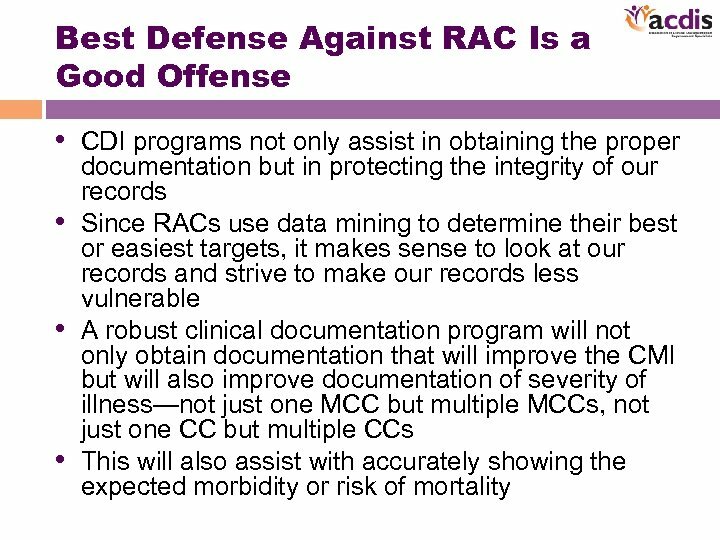 0 (data mining) congestive heart failure. – Without documentation of the type of congestive heart failure, systolic or diastolic, even if the CHF is acute there is no other code other than 428. 0 that can be assigned. – Although CHF (428. 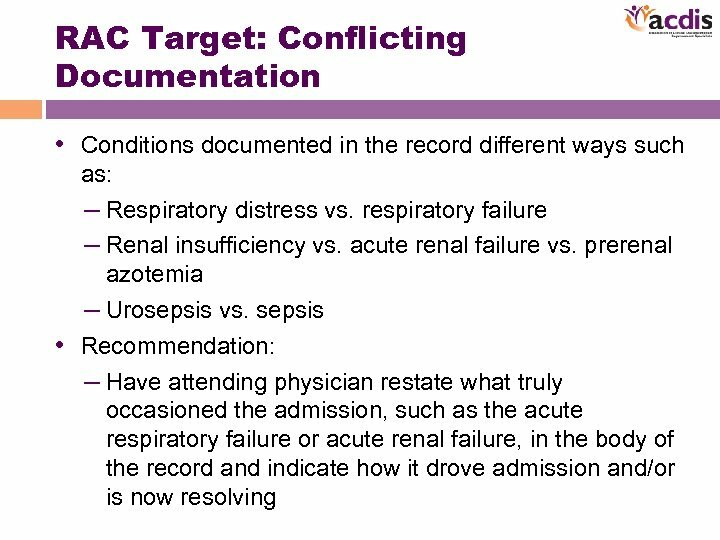 0) can be assigned as a principal diagnosis, this code has been targeted for increased scrutiny to see if the CHF truly occasioned the admission or if the PDX of CHF has been inaccurately assigned. 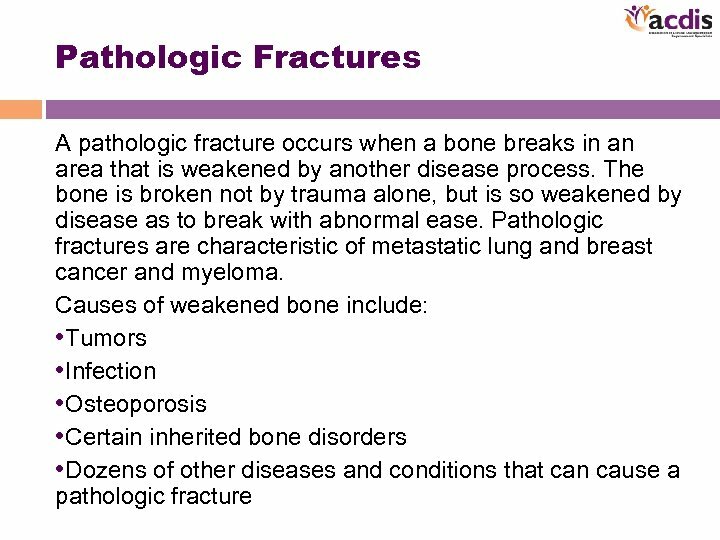 Pathologic Fractures • What’s the issue? 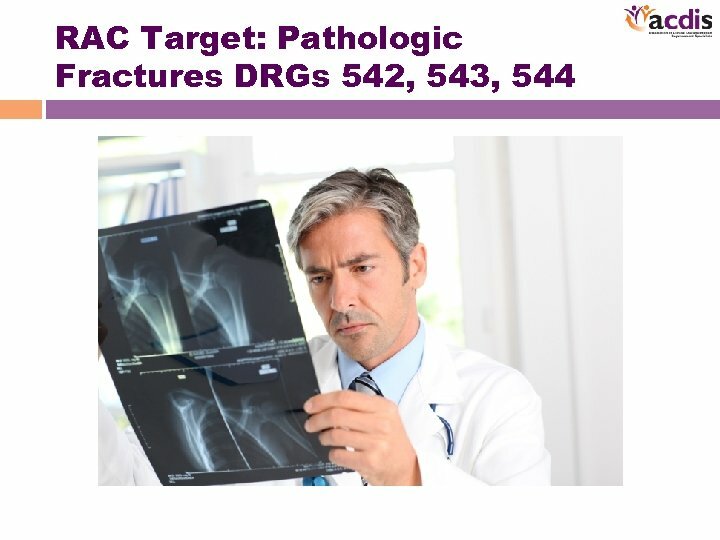 Does the documentation support a pathologic fracture? – Main problem is documentation of “compression fracture. 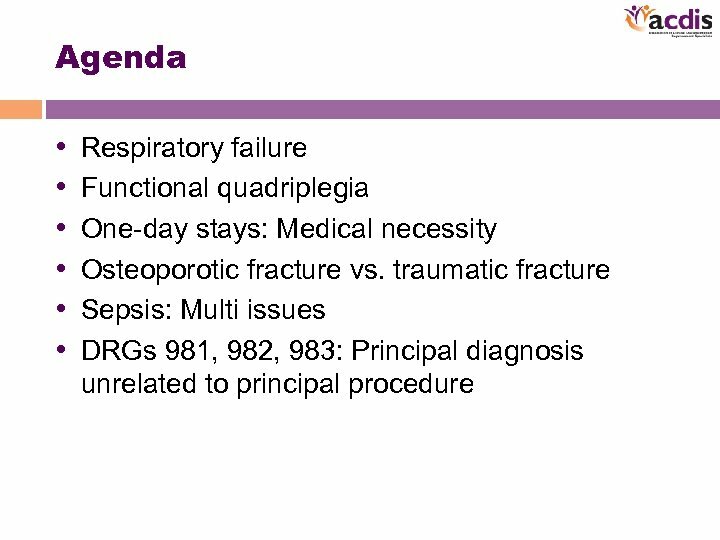 ” • Compression fractures can be either due to trauma or due to pathologic fracture or “weakness in bone” so compression fractures could be miscoded as pathologic fractures when there is no documentation to support this. 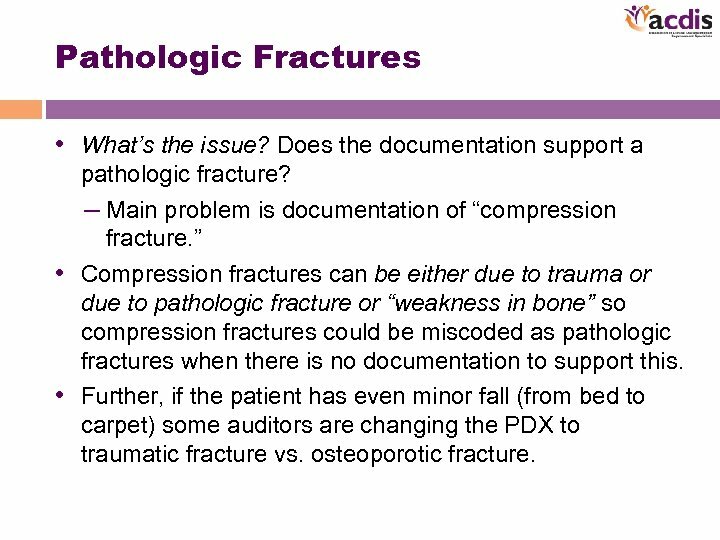 • Further, if the patient has even minor fall (from bed to carpet) some auditors are changing the PDX to traumatic fracture vs. osteoporotic fracture. 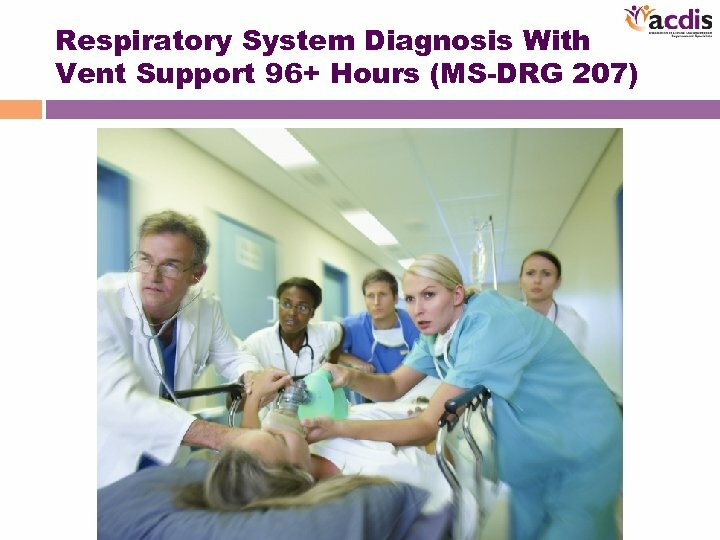 Respiratory System Diagnosis With Ventilator Support 96+ hours (MS-DRG 207) The issues: • Are the hours on ventilator support calculated correctly? 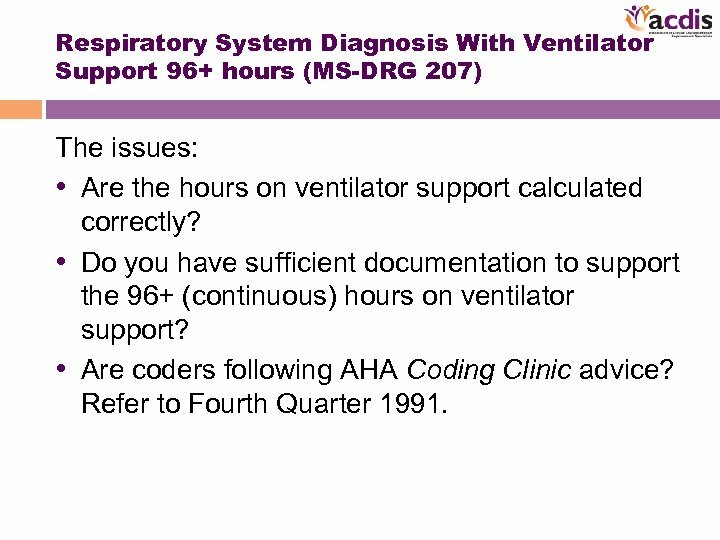 • Do you have sufficient documentation to support the 96+ (continuous) hours on ventilator support? 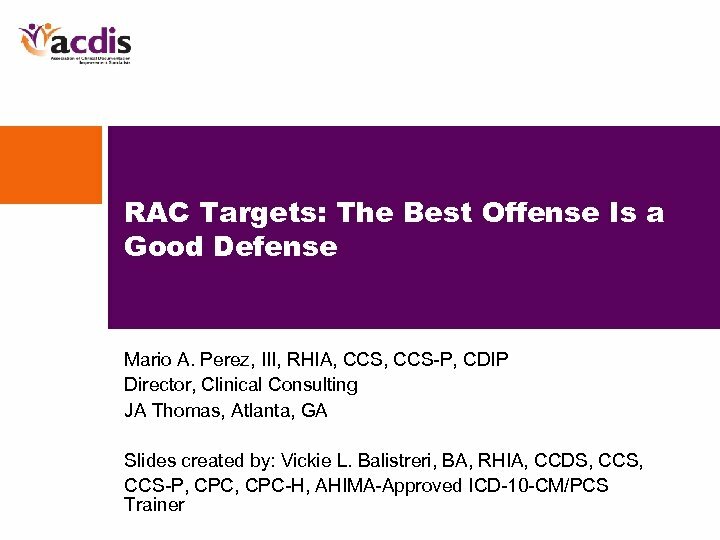 • Are coders following AHA Coding Clinic advice? 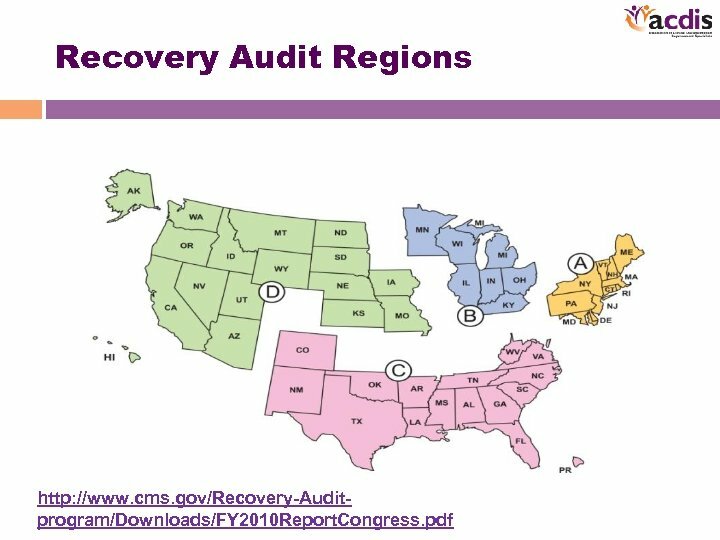 Refer to Fourth Quarter 1991. 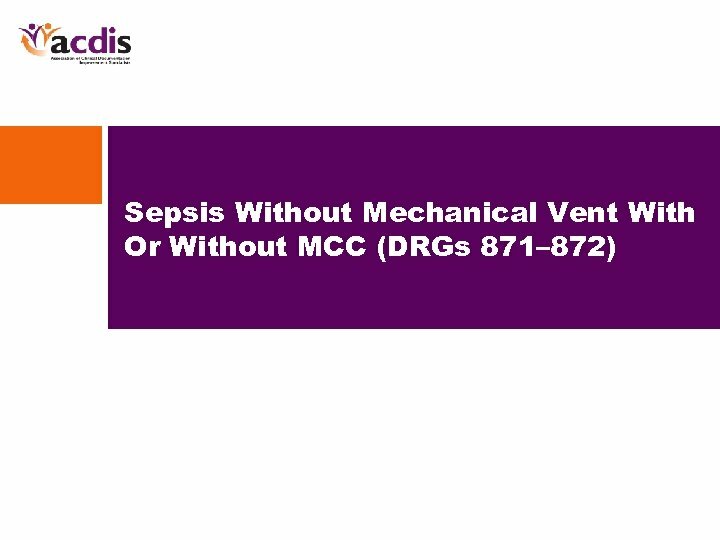 Sepsis Without Mech Vent 96+ Hours (MS-DRGs 871– 872) The issues: • Does documentation within the medical record support the diagnosis of sepsis present on admission, or did it develop after admission? 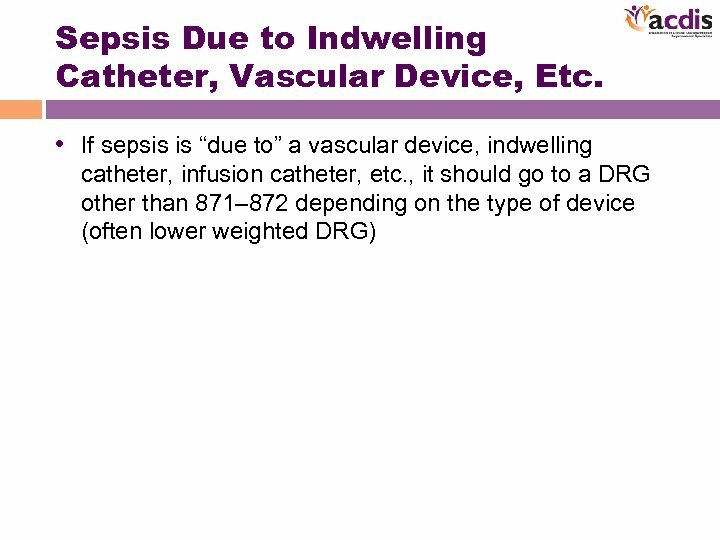 • Is sepsis due to an infected catheter, line, device, etc. ? • Has the physician been queried in reference to his or her clinical diagnosis of urosepsis? 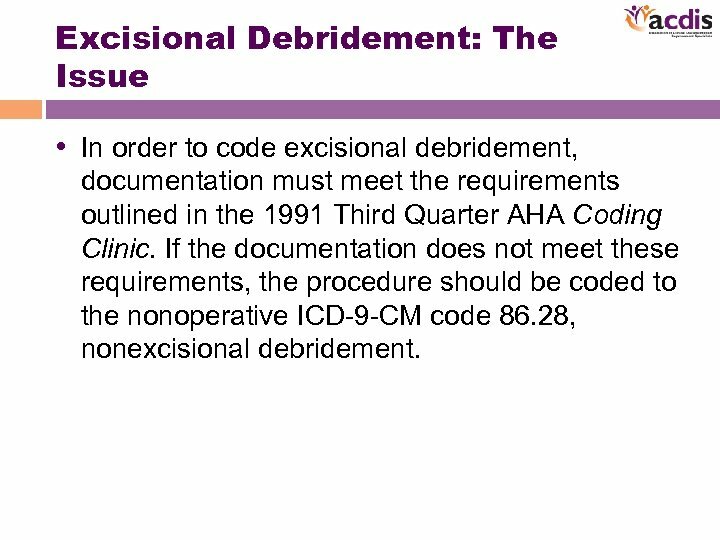 Excisional Debridement: The Issue • In order to code excisional debridement, documentation must meet the requirements outlined in the 1991 Third Quarter AHA Coding Clinic. 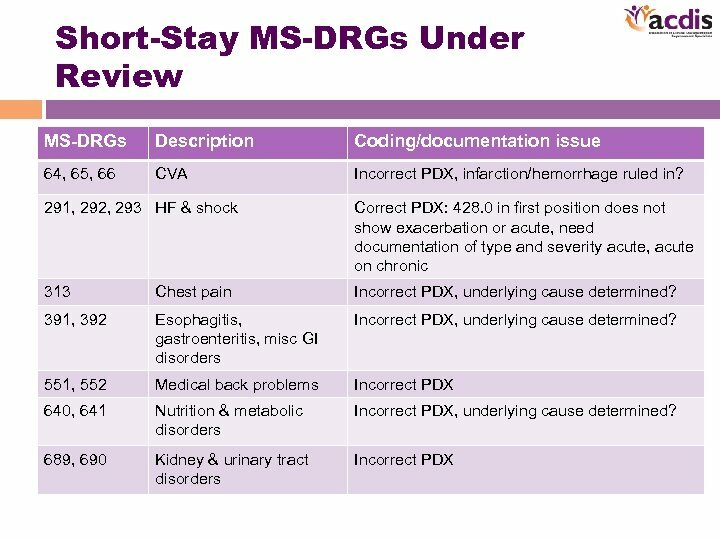 If the documentation does not meet these requirements, the procedure should be coded to the nonoperative ICD-9 -CM code 86. 28, nonexcisional debridement. 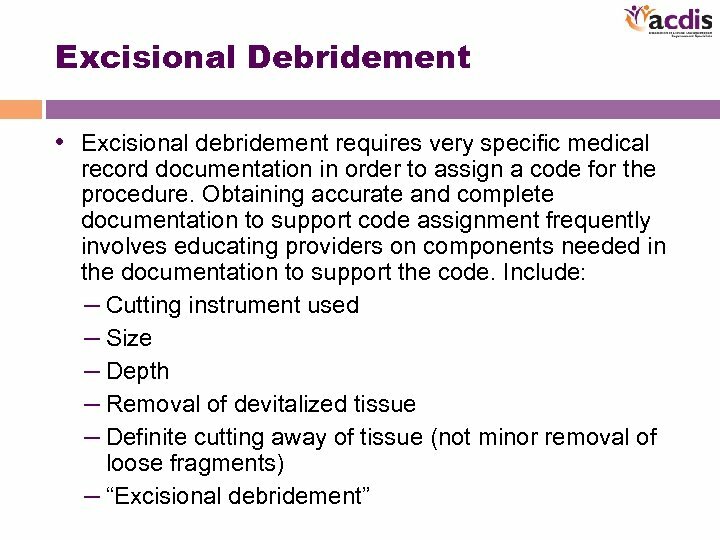 Excisional Debridement: Does Code Describe Correct Depth? 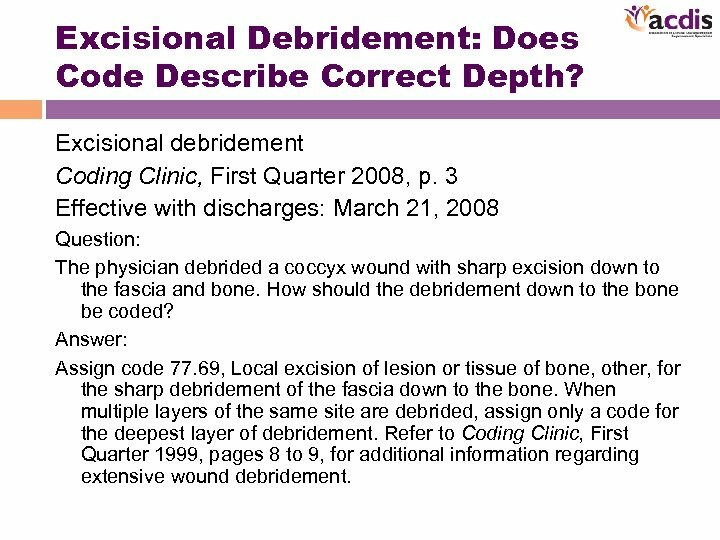 Excisional debridement Coding Clinic, First Quarter 2008, p. 3 Effective with discharges: March 21, 2008 Question: The physician debrided a coccyx wound with sharp excision down to the fascia and bone. 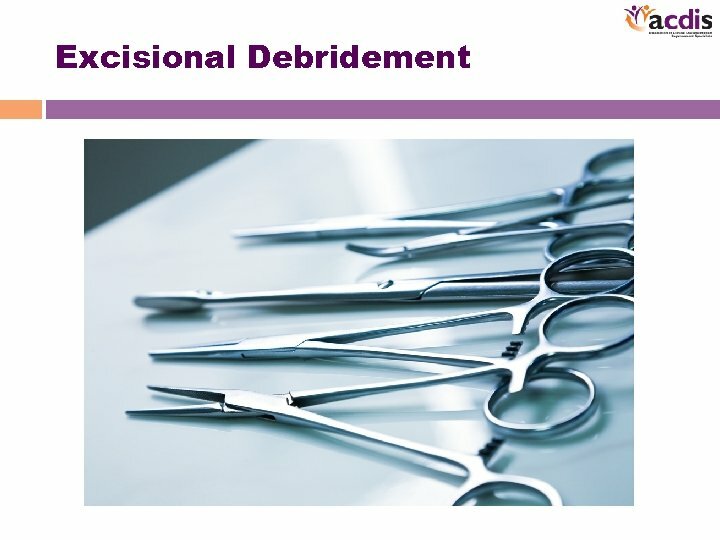 How should the debridement down to the bone be coded? Answer: Assign code 77. 69, Local excision of lesion or tissue of bone, other, for the sharp debridement of the fascia down to the bone. When multiple layers of the same site are debrided, assign only a code for the deepest layer of debridement. Refer to Coding Clinic, First Quarter 1999, pages 8 to 9, for additional information regarding extensive wound debridement. 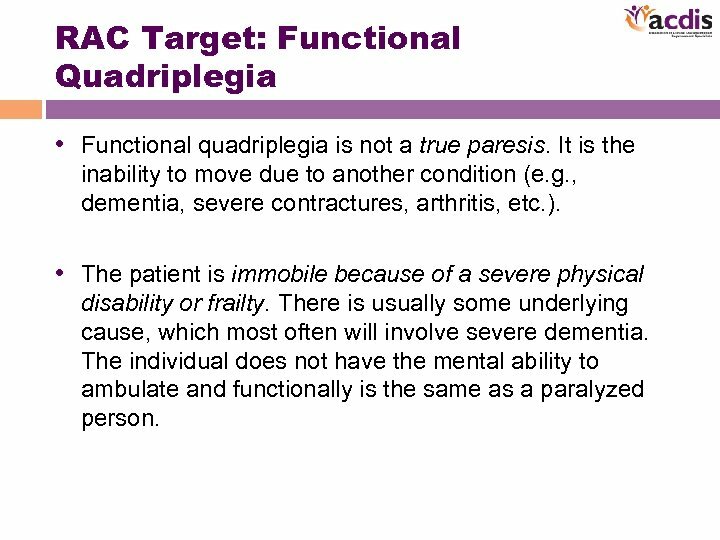 RAC Target: Functional Quadriplegia • Functional quadriplegia is not a true paresis. It is the inability to move due to another condition (e. g. , dementia, severe contractures, arthritis, etc. ). • The patient is immobile because of a severe physical disability or frailty. There is usually some underlying cause, which most often will involve severe dementia. The individual does not have the mental ability to ambulate and functionally is the same as a paralyzed person. 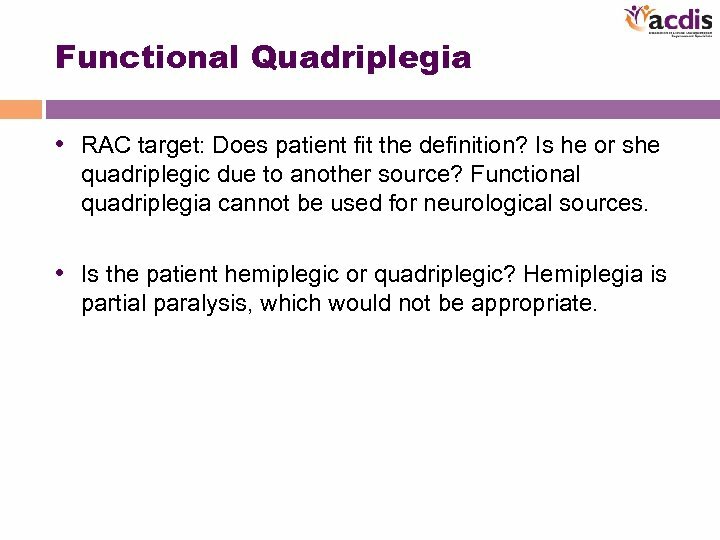 Functional Quadriplegia • RAC target: Does patient fit the definition? Is he or she quadriplegic due to another source? 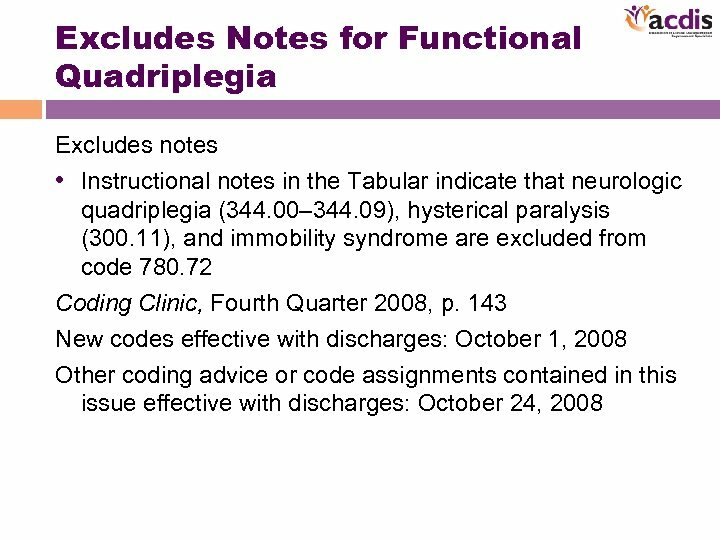 Functional quadriplegia cannot be used for neurological sources. • Is the patient hemiplegic or quadriplegic? Hemiplegia is partial paralysis, which would not be appropriate. 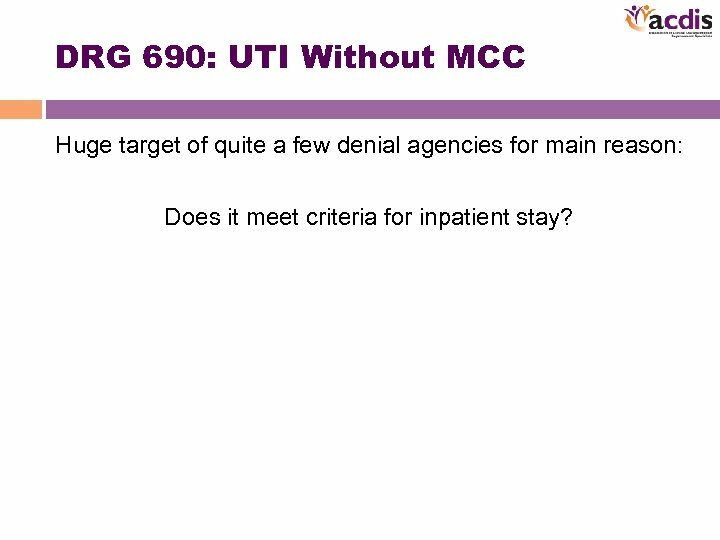 DRG 690: UTI Without MCC Huge target of quite a few denial agencies for main reason: Does it meet criteria for inpatient stay? 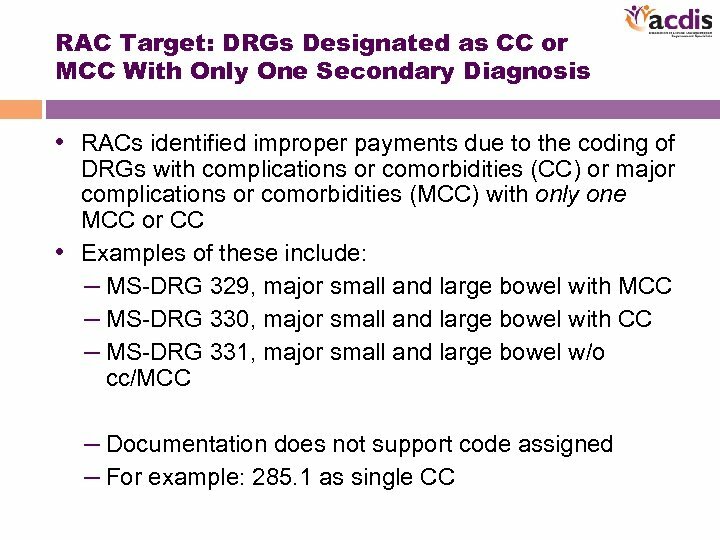 DRGs 981, 982, 983: Extensive OR Procedure Unrelated to Principal Diagnosis w/o CC/MCC (1. 7404) • If the principal diagnosis is one of the diagnoses that occasioned the admission, then the principal diagnosis and the principal procedure should be in the “same family” or match. 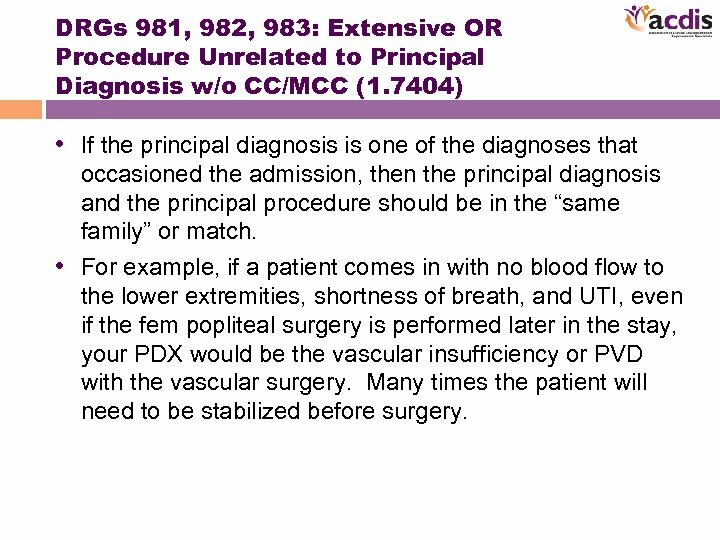 • For example, if a patient comes in with no blood flow to the lower extremities, shortness of breath, and UTI, even if the fem popliteal surgery is performed later in the stay, your PDX would be the vascular insufficiency or PVD with the vascular surgery. 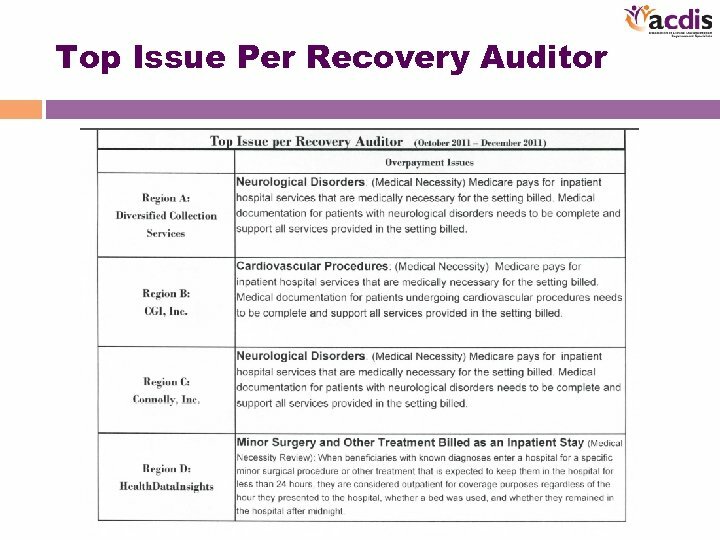 Many times the patient will need to be stabilized before surgery. 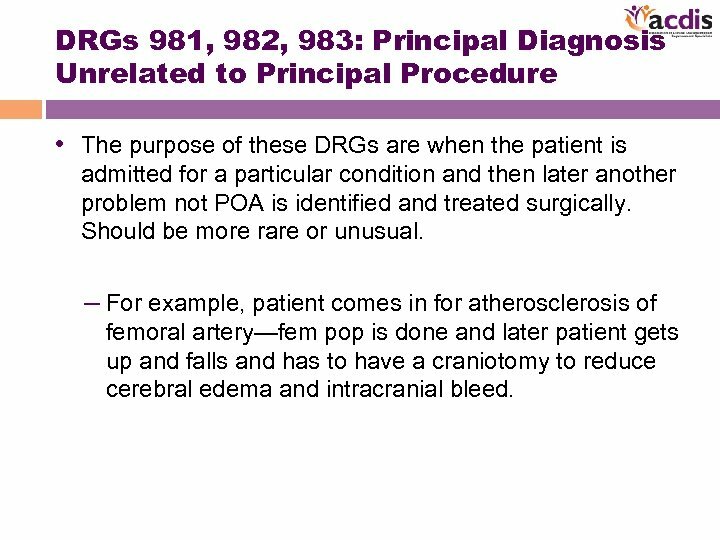 DRGs 981, 982, 983: Principal Diagnosis Unrelated to Principal Procedure • The purpose of these DRGs are when the patient is admitted for a particular condition and then later another problem not POA is identified and treated surgically. Should be more rare or unusual. – For example, patient comes in for atherosclerosis of femoral artery—fem pop is done and later patient gets up and falls and has to have a craniotomy to reduce cerebral edema and intracranial bleed. Questions? 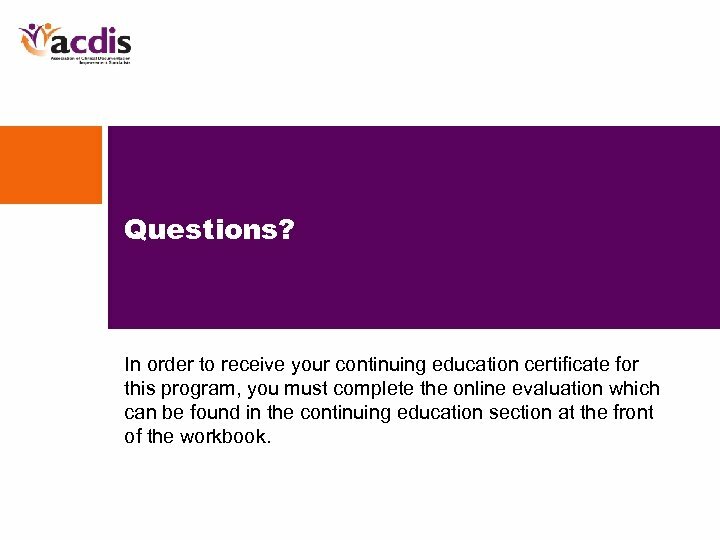 In order to receive your continuing education certificate for this program, you must complete the online evaluation which can be found in the continuing education section at the front of the workbook. 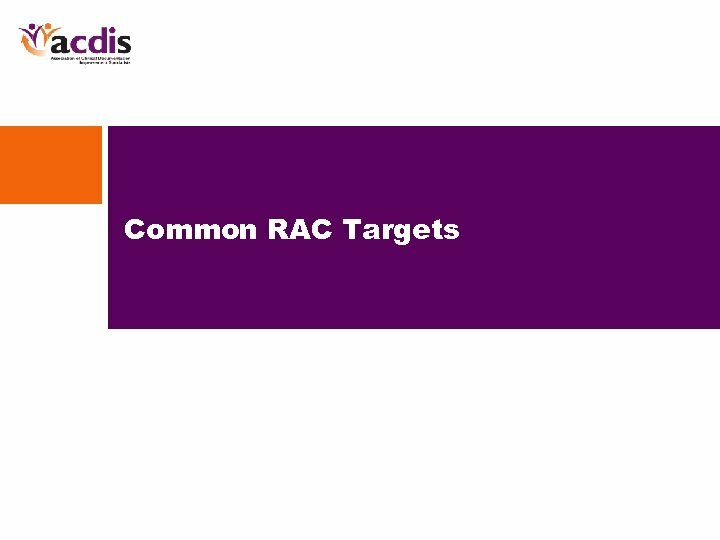 Setting SMART Targets Making sense of target setting!